Powerful and sudden his bite. White with bones and fiery spark. Met with gnash of teeth, clench of jaws. The tethering to its pillar. Now returned to fulfill their fate. To live, love, laugh, cry and exalt. To wrest him into Shadow’s thrall. Of barriers to the Central Sun. Oh! Grand Womb of Becoming freed! In renewal of holy Earth! To rouse him with star signs conveyed. This… momentous… celestial event has presented itself in our skies tonight. 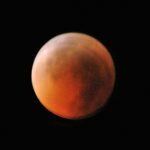 An eclipse of the Moon, occurring precisely at the time of the Winter Solstice is exceedingly rare, the last having occurred in 1554 AD, 456 years ago! And while that in itself is wondrous, the significance of this eclipse to our transitional times is even more impressive. The place in our sky where the lunar eclipse took place is exactly in alignment with the Summer Solstice point, that is, the crossing of the ecliptic plane and the galactic plane where the Sun rises at the time of the Summer Solstice. In addition, as it must be, due to celestial mechanics, the Sun, today, rises at the other end of the ecliptic/galactic plane that denotes the Winter Solstice point (these solstice designations are all Northern Hemisphere determinant). And this point in the sky, if you were to look at the star field behind the Winter Solstice’s rising Sun, is in direct alignment with the very center of our galaxy! This alignment can occur only once every 26,000 years. If there were ever a single moment in time to denote the Turning of the Ages, tonight is the night, as the gears of the cosmic wheels of time and timing coming together in perfect harmony are the factors which determine such cosmological changes. It is not just that this unique alignment of our local Earth/Moon/Sun are in such fine tuned meshing, but also that the local is aligned with the galactic. The center of our galaxy is to our solar system what the Sun is to the Earth and planets. Just as the Moon dances around the Earth, and we ‘circle’ the Sun, so does the Sun, and our whole solar system, ‘circle’ the central hub, the core, the center, of our galaxy. As above, so below. The center of our galaxy is a black hole, but a rather weak one. As a consequence, very little of the mass of matter and energy caught in its pull is actually devoured. A large measure of it is spun back out as X-rays that form a pulsar wind. The radiations emitted at the edge of the black hole are continually bombarding the whole of the galaxy, this solar system and Earth included. A very strange aspect of this phenomenon has recently been discovered by astrophysicists: The rim of the black hole at the center of our galaxy is a hologram! These physicists have even been able to discern pixelation in the pattern of the hologram. When an energy source is broadcast through a holographic imaging plate a 3D projection results. These physicists, from Fermilabs, are now theorizing, with confidence, that our local Universe is a holographic projection. The relevance of this is beyond merely a nicely harmonized mathematical point of precision in the gears of celestial mechanics. It is more than the validation of ancient and contemporary spiritual cosmology that proclaims the material realm to be an illusion… albeit a pretty wonderful one that requires our loving care. As people who are spiritually attuned with the greater workings of the cosmos, we must also investigate the implications, spiritually, of this event and understanding. Cultures who have carried forth the knoledge of the Ancients have always maintained that obstructions to the incoming Light arriving from the Central Sun (galactic core) will cause the nature of Creation to become corrupted and dysfunctional. The program coding is emitted from the Central Sun, our own Sun acts as a focusing lens and then refraction occurs through the facets of the diamond – the planets in their position about us – dynamically changing and shifting the nuance of the incoming coding. As we are the equipment that receives and perceives these emanations from the Center, it strongly behooves us to remove the barriers that we have created to the direct imprint of Creation. Or, you might say, it is imperative that we remove our own corrupted files so that the greater program can unfold with ease in our life and the world about us. The events of this past night have triggered just that grand opportunity. The alignments occurring cause us to go into the equivalent of ‘flat-lining’. From this disengaged-from-the-illusion moment we are able to reboot, to cleanse and purge our own operating system of its corruption and mis-coded patterns that have arisen in our life due to… well, you name it. This phenomenal event that has just occurred is, however, only a half of the picture. In two weeks time, on January 4th, 2011, the Sun will undergo a total eclipse as well! In that moment the ‘flat-lining’ is triggered not just in our own personal mental/emotional realm, but at a planetary scale. The Sun will ‘flat-line’ and we will receive the direct and unfiltered impulse from the Central Sun. That investigation must, however, be presented in its time, as this writing deals primarily with the just-occurred Lunar Eclipse. The photo, above, is one I captured of tonight’s Lunar Eclipse. The poem, Jaguar’s Shadow, describes, with metaphor and symbol – the stuff of the Soul – the significance and unfolding of these events I have written upon herein. Sit with the image and the poem. Let your own experience of the Lunar Eclipse, even if you weren’t able to see it, inform you of the essence and expression of this magnificent and momentous event, as I have sought to do with the combination of the photo, poem and this exploration presented.